I arrived shortly after 8 am (when they start making lunch fare), and liked that the restaurant was not too crowded. I find it's easier to dialogue about gluten-free protocol and ingredients when you're not having to compete with a bustling crowd. Because they were still making breakfast, noodles (they have zoodles and rice noodles), were not being served at that time, which narrowed down my food options to salads. You can see their allergen info right here, and I focused on the salads to see what was safe. 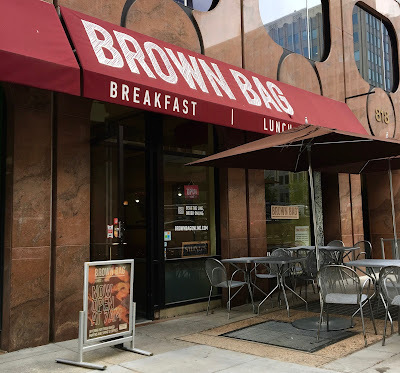 Only three of Brown Bag's regular salads are gluten-free, and the "Remember the Alamo" jumped out to me for it's southwestern flair. 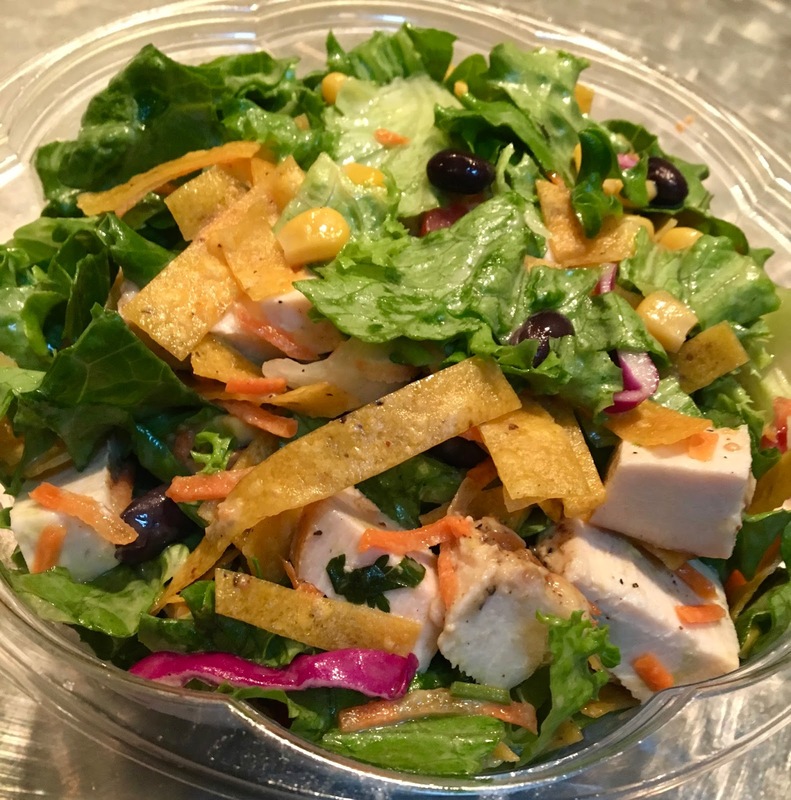 It's made dairy-free sans cheese, and to prevent cross contamination, I asked the staff to change their gloves and use fresh ingredients and a new mixing bowl to make my salad. The salad is loaded with toppings, unlike some other salads I have had which are lettuce-heavy. Tender chunks of chicken, black beans, corn, crunchy tortilla strips, tomato, avocado, and cilantro work in unison over the mixed green base. Everything is coated in a lime-cilantro vinaigrette. Since I picked up my salad in the morning and it had to sit in a fridge for a few hours, the flavor had time to marinate, and the tortilla chips were on the soggy side, but I didn't mind. The salad was good, and I enjoyed the varied textures of the toppings, but it was more flavorless than I was expecting. Don't get me wrong- the vegetables seemed to be fresh, I think it was the dressing that was responsible for the lackluster flavor. When I think of a southwest-inspired salad, I want bold flavors and the lime and cilantro flavors promised by the vinaigrette's description didn't convincingly shine through. Maybe it would have helped to request it on the side, but the thought didn't cross my mind when ordering. 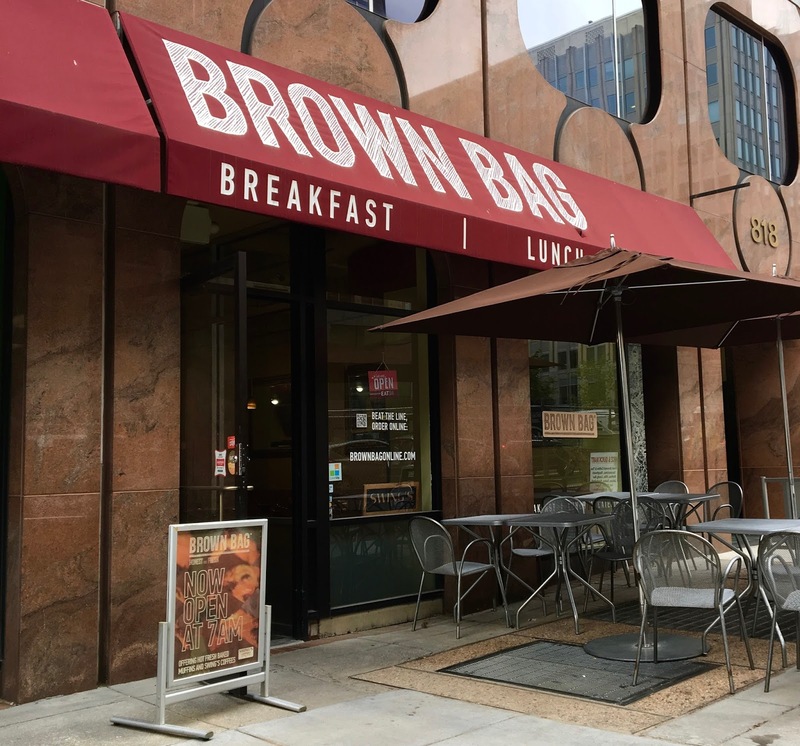 Brown Bag wins points for convenience, but it does not distinguish itself among other fast casual chains that have more gluten-free options and fresher flavors. The gourmet salad game in D.C. is strong, and this salad did little to impress. That being said, it hit the spot for lunch, and I always appreciate when I can get many servings of vegetables out of a meal.